Shelley Fisher Fishkin, Professor of English and Director of American Studies at Stanford is editor of the 29-volume Oxford Mark Twain, and of The Mark Twain Anthology: Great Writers on His Life and Work (The Library of America), on which the comments that follow are based. She is also the author of From Fact to Fiction: Journalism and imaginative Writing in America, Was Huck Black? Mark Twain and African American Voices, Lighting Out for the Territory: Reflections on Mark Twain and American Culture, and A Historical Guide to Mark Twain. 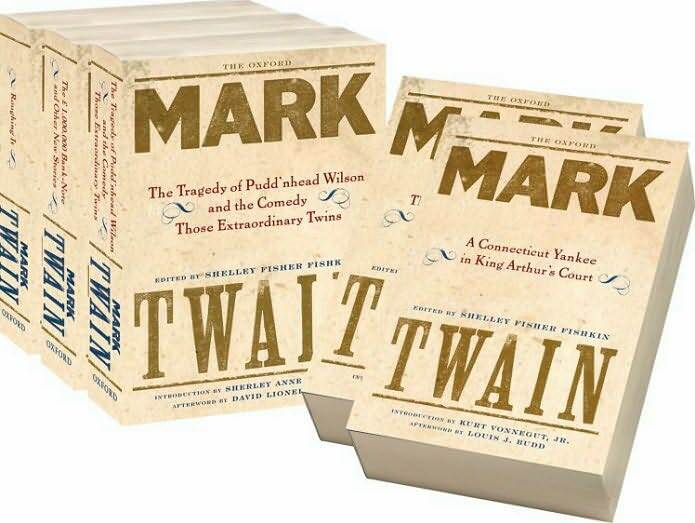 We asked Fishkin to contribute to the blog in honor of the centennial of Twain’s death. Ernest Hemingway said in 1935 that “All modern American literature comes from one book by Mark Twain called Huckleberry Finn.” But these days, as scholars increasingly focus on transnational dimensions of American culture, perhaps it’s time to look at Twain’s impact on writing outside of America, as well. The fact that this year marks the centennial of Twain’s death, the 175th anniversary of his birth, and the 125th anniversary of the U.S. publication of his most celebrated book makes it a perfect time to widen our angle of vision. Writers the world over marveled at the art Twain wrought from the speech of ordinary people–speech whose previous appearance in literature had most often been treated with ridicule. Jorge Luis Borges, who believed that Huckleberry Finn “taught the whole American novel to talk,” observed that in Huck Finn “for the first time an American writer used the language of America without affectation.” Borges believes Twain’s novel to be the progenitor of two other works of world literature, Ricardo Güiraldes’ Don Segundo Sombra, and Rudyard Kipling’s Kim. Twain’s dazzling experiments with the vernacular helped inspire writers around the world to create art out of the language spoken by their countrymen–writers like Johannes V. Jensen, considered the first great modern Danish author, who went on to win the Nobel Prize for literature. I heard Japanese Nobel Laureate Kenzaburo Oe give a speech in Austin, Texas in 1996, in which he described how his mother had bartered some rice to procure a copy of Huckleberry Finn for him in war-torn Japan, carefully instructing him to tell his teacher, if she asked, that “Mark Twain” was the pseudonym of a German writer. That evening in Austin he spoke of the book as having had a profound affect on his response to the United States. But when I read his first novel, The Prize, or The Catch, the unmistakeable resonances with Huckleberry Finn that I spotted had persuaded me that the Twain’s novel had shaped more than his attitude toward my country: I suspected that it had had an important impact on Oe’s development as a writer, as well. At a reception after his talk I asked him whether his first novel was responding directly to Twain’s most famous novel. Oe beamed and a long conversation followed. He then wrote in my copy of his latest book that I had brought for him to sign, “Yes, I agree with your opinion about Huck, the narrative of my first novel is under the shadow of Huck.” The Japanese scholar Shoji Goto “has suggested that since Oe’s works have had a tremendous impact on postmodern Japanese literature,” Huckleberry Finn, through Oe, has played an important role in the development of that literature as well. The Yiddish writer Maks Erik argued that Sholem Aleichem drew inspiration in one of his key books from Tom Sawyer. In a speech he gave in Beijing in 1960 on the 50th anniversary of Twain’s death, the great Chinese writer Lao She showed himself to be a careful and appreciative reader of Twain, familiar with the full range of Twain’s writings. But scholars have yet to investigate what China’s most celebrated humorist and satirist have learned from Twain. Twain’s works have been translated into over 75 languages, and editions have been published in virtually every country in which books are printed. But we have only just begun to probe the ways in which his work shaped writing in many of these languages around the world. A good project for the 21st century! Wow! I never knew Hemingway said that about Twain’s “Huckleberry Finn”…I guess that just goes to show how influential Mark Twain has truly been on modern American literature. Thanks for sharing this article.